The 10th of Dhul Hijjah is the Day of Sacrifice, referred to in Arabic as ‘Yaum Al Nahr’, especially by the pilgrims who are in Saudi Arabia performing Hajj. It is also the greatest day of the year for Muslims around the world, i.e. those who are not performing hajj. These great deeds are: stoning the jamarat, offering the sacrifice of an animal, shaving the head (for men) or cutting the hair (for women pilgrims), Tawaf al-Ifada (the special circumambulation of the ka’bah that is a main pillar of hajj), followed by the strenuous sa’i (walking between the mounts of Safa and Marwah). Finally, after all these sacred and symbolic rites have been done, pilgrims perform ghusl and leave the state of ihram, which puts an end to all of its restrictions except the prohibition of sexual relations with one’s spouse. All these important rites are carried out by pilgrims from the dates of 10th. Dhul Hijjah till the morning of the 13th of Dhul Hijjah. Whether a Muslim is a pilgrim performing hajj, or if they are present anywhere else in the world, the days of 10th till 13th Dhul Hijjah are special days that involve the remembrance and worship of God. 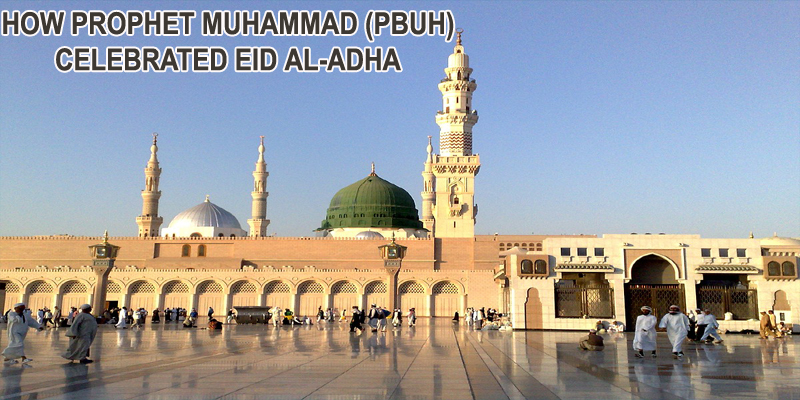 The Eid prayer on Eid Al-Adha is offered the same way as it is for Eid ul Fitr. The day begins early with the family taking a ghusl (full bath) after Fajr prayer and putting on new clothes to proceed to the Eid prayer place, reciting takbirs along the way. Despite this “Day of Sacrifice” commencing the period of Eid festivities which involve eating and drinking as encouraged by the Prophet, the sunnah of the Prophet for the first part of this day is not to eat anything in the morning before or after the Eid prayer, and to break this short fast only with the cooked meat of the sacrificial animal. This means that on the day of Eid Al-Adha, if one wants to follow the sunnah of Prophet Muhammad related to this day to earn extra rewards, one should not eat or drink anything until one’s animal has been sacrificed after the Eid prayer, and its meat (usually the liver is the first part to reach one’s hands) has been cooked. The sooner the animal is sacrificed after Eid prayer on the morning of 10th. Dhul Hijjah, the greater the reward. However, this sacrifice can be done on any day between 10th. and 13th. of Dhul Hijjah. The narrations above prove that while the Prophet encouraged Muslims to eat meat on Eid Al-Adha, he himself did not eat it regularly in his daily life throughout the rest of the year. This should be a lesson for us in preventing the committing of excess in our meat intake. The narrations above also throw light on the wisdom behind the Prophet’s command not to store the meat from the sacrifices for more than 3 days, during that particular year in which most of the Muslims were needy and starving. He wanted the facilitation of charity and sharing during that period of hardship. He also wanted all the meat to be consumed in order for food to be abundantly running through the community of Muslims that year, most of whom were starving, the way blood runs through all the veins of a single body to keep it thriving.